Veteran Indian banker KV Kamath has thanked Narendra Modi’s government for the opportunity to head the newly established BRICS New Development Bank. He will take over the presidency in the next 10 days after he leaves various board positions. "I look forward to the establishment of the bank and commencement of its operations in the service of the BRICS nations," the banker said in a statement on Friday. KV Kamath said he was “honored and humbled” to be nominated by the government of India as the first president of the New Development Bank, thanking the government for placing confidence in him. While the bank is headquartered in Shanghai, the Indian government had the right to nominate its candidate. Kamath will take over the new position in the next 10 days after he retires as non-executive Chairman of ICICI Bank and leaves other various board positions he holds, India’s Finance Secretary Rajiv Mehrishi told reporters in New Delhi. Kamath is well-recognized in India for being named 'Businessman of the Year' by Forbes Asia, 'Business Leader of the Year' by The Economic Times, India, in 2007, and CNBC's 'Asian Business Leader of the Year' in 2001, and The Asian Banker Journal of Singapore’s ‘Most e-savvy CEO amongst Asian Banks’. India couldn’t have made a more perfect choice, said investment banker Hemendra Kothari, chairman of DSP BlackRock. Prior to KV Kamath’s appointment other heavyweight economic figures in India declined the role. Reserve Bank of India governor Raghuram Rajan showed no interest in the post. Experts connect the unwillingness of leading Indian bankers to take the post with the fact that with an Indian is head; the bank roller is clearly China. Beijing welcomes and "fully supports" the appointment, said China's Foreign Ministry spokesperson Hua Chunying on Tuesday. The $100 billion BRICS New Development Bank (NDB) is a lending institution expected to challenge the World Bank and the International Monetary Fund. The Bank is to start functioning by the end of 2015, with its headquarters in Shanghai. Earlier this week Russian Deputy Finance Minister Sergey Storchak invited Greece to become the bank’s sixth member. Greek Prime Minister Alexis Tsipras confirmed the offer and told Storchak Greece was interested. 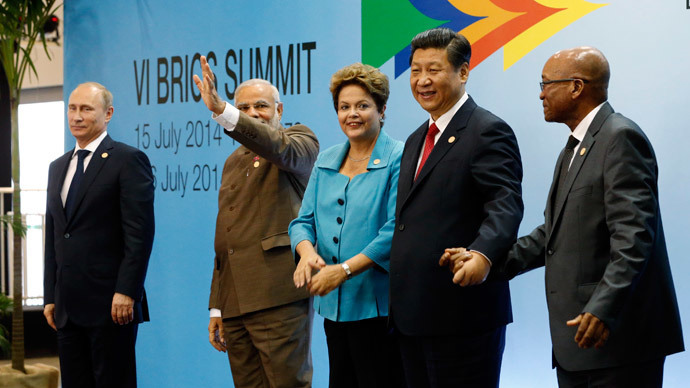 The BRICS nations account for nearly $16 trillion in GDP and 40 per cent of the world's population.